Marantz reveals M-CR611 and M-CR511 network media systems | What Hi-Fi? It's been a couple of years since Marantz introduced the M-CR610 and M-CR510 network media systems. Today, Marantz has announced updated versions which feature high-res audio support, DLNA and AirPlay streaming, and Spotify Connect. 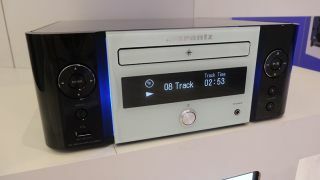 The M-CR611 network CD-receiver system bears a similar design to its M-CR610 predecessor, but now comes with a small illuminated strip on the front that can be changed from white to blue, green or orange. As for features, you’ll find a CD player, FM, DAB and DAB+ radio tuners, built-in wi-fi and Bluetooth with NFC compatibility, as well as Spotify Connect and AirPlay. The M-CR611 also features high-res audio streaming up to 24-bit/192kHz, and DSD 2.8MHz support. On the back there are two optical inputs and a USB input. A second USB input is on the front of the unit. These will charge iDevices when the unit is in standby mode. There are two sets of speaker terminals, and output power is rated at 60W into two channels, or 30W into four. Volume levels for the A and B speaker outputs can be adjusted individually. The Marantz M-CR611 is due out on 15th August for £499. The M-CR511 loses the CD player function, but keeps the network playback support with high-res audio streaming, wi-fi, Bluetooth with NFC, Spotify Connect and AirPlay. It will support a range of file types, including WAV, FLAC, AIFF, ALAC and DSD. There’s just one optical input and two USB inputs. Both the M-CR511 and M-CR611 are controllable via the new Marantz Hi-Fi Remote app. The Marantz M-CR511 is also due out on 15th August, for £329.